Nothing is ever simple in the Middle East. Take the cease-fire that Israel and Hamas have observed since June 19  well, O.K., neither side calls it a cease-fire; Hamas calls it tahdiya, loosely translated as "calm," but the Israelis don't like to name it because they don't like admitting that they've made a deal with people they brand as terrorists. Whatever they want to call it, each side accuses the other of violating the terms of the understanding, and rockets have been flying out of Gaza over the past month as if the truce didn't exist. That same truce is up for renewal on Dec. 19  at least, according to the Palestinians it is (again, the Israelis demur). But even as Hamas ratchets up the pressure in hopes of getting a better deal and Israel pushes back, neither side is ready to return to open hostilities right now, despite the fact that both believe a duel to the death is inevitable. Foreign Minister Tzipi Livni described the rocket fire as "intolerable" and called for action. Interior Minister Meir Sheetrit was even more direct. "We have to act in Gaza, and instead of defending, we have to attack," he said. "I want people to be building shelters in Gaza, not in Israel." (The Israeli government will reportedly spend $170 million on building bomb shelters for homes within a 4-km range of Gaza.) Comments from Livni and her allies reflect the tough election challenge they face against the more hawkish former Prime Minister Benjamin Netanyahu. Israeli security sources tell TIME that Israel remains unlikely to invade Gaza as long as none of the rockets fired from there inflicts mass casualties. "All it would take for the entire equation to change is for one of those rockets to hit a school or a bus," said one security official, who asked to remain anonymous. "That would force Israel to mount a massive response." Notwithstanding the escalation in rhetoric by its leaders, Israel's Cabinet last Wednesday decided against changing the army's standing orders to respect the truce. Despite Israeli concerns that allowing more than 250 mortar shells and rockets to be fired at Israel without a massive response weakens the nation's deterrent capacity, a number of factors restrain it from invading Gaza. A full-blown ground operation would result in dozens of Israeli military casualties in what would be a house-to-house infantry operation. Such an operation would also jeopardize prospects for negotiating the release of captive soldier Gilad Shalit. And it would almost certainly inflict scores of Palestinian civilian casualties, which would fuel support for Hamas and further undermine the already weak President Mahmoud Abbas, whom Israel has been trying to bolster. Israeli military officials also fear that there's no exit strategy from a Gaza invasion. "How are we supposed to be in charge of the Similac in Gaza City if we conquer it?" asked one Israeli military official, referring to a popular brand of infant formula. "Are we conquering it for Abu Mazen [Abbas]  is he capable of taking over? Nobody in the Israeli government has answered these questions that would have to be answered if we went in." Israel needed the truce when it was brokered in June, since it was the only effective way to stop the constant barrage of rockets from Gaza on its southern towns. Frequent air strikes and limited incursions, as well as choking the life out of Gaza's economy by closing off the territory, had failed to suppress the rocket fire, and a full-blown invasion carried a prohibitive price tag. Hamas needed the truce to relieve the catastrophic economic strain imposed by the Israeli siege and to consolidate its control over Gaza. And so, for very different reasons, the two sides found themselves negotiating a truce  not directly, because neither side recognizes the other  but through an Egyptian mediator. Hamas initially insisted that the cease-fire apply to not only Gaza but also the West Bank, where Israeli military operations have suppressed both militant and political activity by the Islamist party. Israel demurred. Then, in order to sell the tahdiya to Hamas  and to help the group's leaders sell it to skeptics on their own side  the Egyptians agreed that new terms would be negotiated after six months (i.e., right now). That's not how the Israelis see it, of course, and they're in no mood to give any ground to Hamas, even as the group uses renewed rocket fire as leverage to press for the opening of crossings with Israel to commercial traffic and the opening of Gaza's border crossing with Egypt at Rafah. Apparently, assuming that Israel will refrain from upping the military ante ahead of its elections and before an Obama Administration is installed  TIME has reported that the U.S. is urging Israel to refrain from invading Gaza during the White House transition  Hamas appears to be using the current rocket barrage to improve its bargaining position. 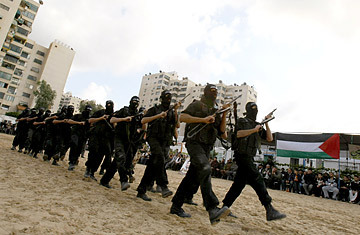 "Hamas is trying to push the envelope," says Brigadier General Shalom Harari, an Israeli reserve officer and analyst. "They want to raise the number of rockets they can fire without eliciting a strong Israeli response." Hamas may also be pushing for tactical gains, like doing away with a 600-m no-man's land established by the Israeli military on the Palestinian side of the boundary fence. But its priority is to ease the siege by persuading Israel to open the border crossings. The Israelis say the way to do that is by stopping the rocket fire; the Palestinians charge that Israel failed to allow normal traffic into Gaza even when Hamas was suppressing its rockets. But despite the limits on what Israel is offering, Hamas can't afford further deterioration of the humanitarian situation in Gaza or disruption of its political control through potential air strikes on its leaders. So, though the coming weeks are likely to see plenty of brinkmanship, failing any dramatic new developments, the current cease-fire is likely to continue and with it the uneasy stalemate between Israel and the Palestinians.